You may have been living under a rock if you haven’t heard all the buzz surrounding alkaline water. The many health benefits it seems to have makes it worth a look. Should you be drinking alkaline water? 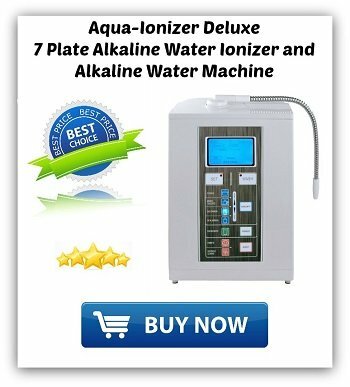 1 What Is Alkaline Water Anyway? 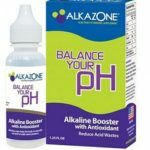 2 Why Should I Drink Alkaline Water? 5 Lemon? Isn’t That Acidic? What Is Alkaline Water Anyway? Alkaline water is H2O that has been ionized, meaning the water’s pH (hydrogen) level has been increased. A process called electrolysis separates the acid and the alkaline properties in the water. Alkaline water has a pH level of around 8 or 9. A pH of 7 is the normal level of tap or bottled water. Hydration – The water molecules are smaller and are more readily absorbed by your cells. Being properly hydrated is critical to achieving good health. Vitamins and Minerals – Alkaline water has minerals like magnesium and calcium, both of which are crucial to maintaining healthy bones. Ionized water is also thought to provide your body with anti-oxidants, the little soldiers that destroy damaging free radicals. This can slow the aging process. Decreased Acidity In The Body – science has shown acidity to be detrimental to our long-term health. Alkaline water lowers acid levels in the stomach and gastrointestinal tract (G.I.). Immunity – You can boost your immune system by helping your body neutralize the acidity in our bodies due to poor diet, stress and environmental toxins. A healthy body is alkaline. 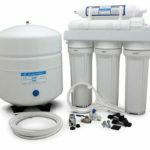 If you are not quite sure about investing in bottled alkaline water or a home water ionizer, then make your own at home. With the proper ingredients and some guidance, you can learn to make water alkaline and see for yourself the way it can enhance your health. You will need a few simple ingredients and implements to make alkaline water at home. One-gallon container with a tightly fitting (screw top) lid-preferably a glass container but plastic will work, too. Pour a half-gallon of the distilled or filtered water into the gallon jug with a lid. Add one teaspoon each of baking soda, sea salt and coral calcium powder to the container. Wash the lemon and slice it in half. Squeeze as much of the juice out of it as possible into the small bowl. Fish the seeds out of the juice and discard them. Pour the juice into the water/baking soda/coral calcium mix. Secure the container lid and then shake it vigorously to thoroughly mix all the ingredients. Add the rest of the distilled water to the container, being sure to leave an inch of space at the top of the container for air. Close the container tightly and give it a good few shakes to mix all the water. Using the pH strips according to the package directions test the water to see what level you are. Ideally, you will have achieved a pH level of 8 or 9. If that is not the case, add another ¼ teaspoon of baking soda to the mix and test again. Keep adding the baking soda in small quantities until the proper pH is reached. Be sure to note how much you used for the next batch of alkaline water you make. Now that you have the desired pH level in your alkaline water, store the sealed container of water in the container. Enjoy a few glasses daily. Yes, lemons are acidic, but they have an alkalizing effect on the body when digested. They also add some refreshing zing to the taste of your alkaline water. Simply squeeze the juice out of the fruit, discard the seeds and add it to water. 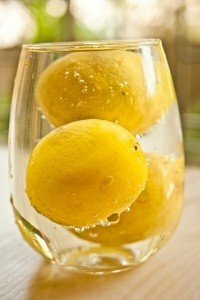 Use 1/8 teaspoon of lemon or lime juice, per 8 ounce glass of water. Eating foods that are alkalizing can be an additional way to increase the benefits of drinking alkaline water. If you are seriously time-crunched or traveling, you can make alkaline water by adding a few alkaline drops. You can find the drops in health food stores or order it online. The drops range in price from $30 to $100 depending on what size bottle you purchase. Read the directions carefully before you add them to your water (more is not better!) and be sure to store the water you don’t drink right away in the refrigerator.